I was an enthusiastic graphic artist on and off from an early age until my penultimate year at school. Since then I've not had the time to pursue this interest. This is the only item extant. 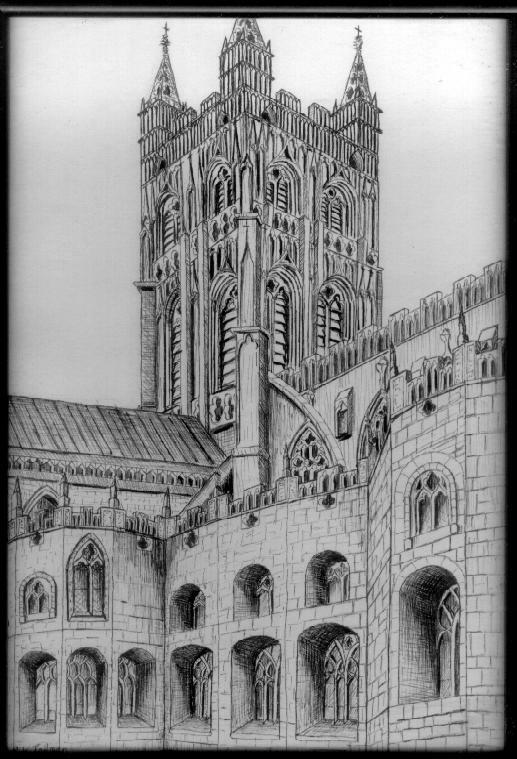 You will, of course, recognise it as an unusual view of Gloucester Cathedral. The discerning tourist will be able to sit on the very bench from which it was drawn. It was produced in the summer of 1969, just before the commencement of my "O" Level year, and appeared in the Crypt school magazine (imaginatively entitled The Cryptian) as a black blob, along with an accompanying poem (which for some reason received more appreciative comment). Modern reproductive techniques have done less of an injustice to this amazing artwork. You will note the obsessive attention to detail to the detriment of the wider picture, a fact symptomatic of my life as a whole. As an aside, Gloucester Cathedral was the scene of the sending-off, to the sounds of Widor's Toccata on the Cathedral organ, of my mother, Mrs. Elizabeth Todman. She had been a "regular" at the services and study groups for the last decade of her life, having migrated from St. Peter's RC. I had to make a brief speech in the Choir. "Brief" equated to 20 minutes in the end, if memory serves. I should write up the notes one day, though this is a dangerous activity. As a further aside, I was reading "Smart (J.C.C.) - Sensations and Brain Processes" the other day, which contains a couple of footnotes referring to Wittgenstein's ideas. These are remarkably guarded and hedged about with caveats as to whether or not Wittgenstein might or might not have supported the interpretation on offer - and Ludwig Wittgenstein had been dead 8 years by the time the paper was written in 1959. I feel a similar terror at the thought of misinterpreting my mother. She was an interesting lady.